Along with the 24-Mpix sensor for still shots, videographers will appreciate the UHD 4K video at up to 30 fps and the 3.0-inch 0.9m-dot tilting LCD monitor. The magnesium alloy body is weatherproof, and despite the small size, the camera has a tiny 2.3M-dot electronic viewfinder with 0.7x magnification. 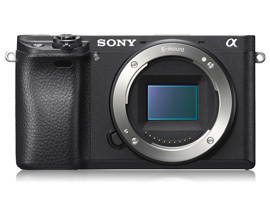 The A6300 achieved a DxOMark score of 85 points, making it currently the best-performing APS-C size sensor in the company’s range. It shows performance gains over both the 24-Mpix A6000 and the A77 II, as well the highly-regarded NEX-7 (introduced back in 2011). The sensor has excellent low noise levels at base, resulting in a wide dynamic range of +13.7 EV, yet maintains both a relatively wide dynamic range and low noise at high ISOs, especially when compared to those earlier models. As with previous tests, the DxOMark score reflects the sensor performance and is not intended as an overall rating for the camera. Comparing sensor performance with the earlier APS-C A6000 and the full-frame A7 II, we can see that the new chip in the A6300 shows some interesting results. Indeed, despite the A7 II having slightly lower noise (as we might expect from the sensor’s larger surface area), the A6300 has comparable dynamic range at base, and thanks to a mid-range boost at ISO1600, it has a slightly wider dynamic range. The A6000, on the other hand, has a little less dynamic range at base (although still good), but it falls away from ISO 800 onwards. The color sensitivity results show a similar pattern for the A6000; and ultimately, the A7 II has the upper hand in low light, extending to a +0.75 EV advantage in our low-light ISO comparison. Still, the A6300 achieves an impressive result, even if it confirms the advantage that full-frame sensors have over cropped imagers. The relatively high price of the A6300 puts it up against some formidable DSLR models with impressive sensors. We’ll leave the discussion about the merits of different models to sites run by our good friends at DPReview, but purely in terms of sensor dynamics, the diminutive A6300 performs similarly to the Nikon D7200 across the whole gamut. The new sensor in the Canon EOS 80D is also impressive with regard to imaging performance; however, it can’t quite match the ultra-low noise levels of either rival. That’s not to say the Canon sensor is a poor performer in anyway — not at all, but it’s just not quite up there with its peers (and the camera itself may well be better than either one in other ways, but that’s not what we’re discussing). Color sensitivity is lower on the Canon at every ISO setting, whereas as the A6300 is pretty much the equal of the D7200. However, while the A6300 has a wider DR than the EOS 80D at every ISO setting, it isn’t quite so impressive as the D7200’s DR, at least at low ISOs. A mid-range boost sees the A6300 match the D7200, which is good news, but ultimately accounts for the slightly better overall score. All three models, however, perform well in our low-light ISO comparison, with the Canon a close third place. Sony’s A6000 sensor was class-leading when it was introduced, and while the sensor in the A6300 is in a similar position, it’s not alone. Nikon’s sensors in the D7200 and the more cost-conscious D5500 perform similarly. In terms of specifications, the A6300 looks attractive, and for some metrics, its sensor performance, dynamic range in particular, can match the 24-Mpix full-frame A7 II. However, the price seems somewhat at odds with rival offerings. Even taking into account the premium for its 4K video and AF capabilities, it’s much harder for it to compete at this level. But as far as sensor performance goes, it doesn’t get a lot better.